Here is an image taken from my own painting, but adjusted some in Photoshop, to create something perhaps a little cubust and a little surrealist. I tried to be as subtle as I could, so that it's not rediculously obvious that I monkeyed with it in Photoshop too much. 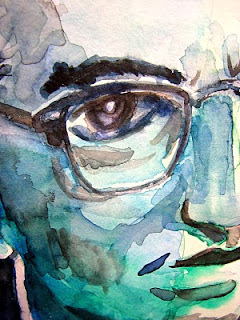 Here is a detail frm the original painting, revealing some of the brush work and layers of transparent color. 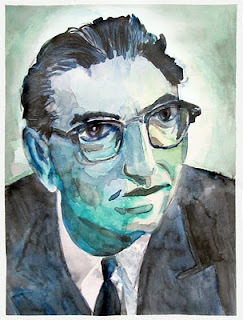 And here is the original watercolor painting of 20th century existentialist psychologist (he might say "logotherapist"), author, and Holocaust survivor, Viktor Frankl. No, I didn't mean to make him look like the Hulk or an alien- I was simply using analogous colors (colors next to each other ont he color wheel), in this case, blue and green. 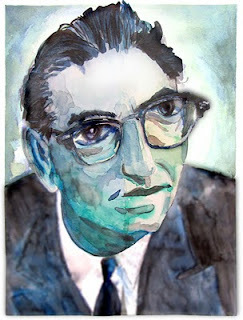 Believe it or not, I used very little black, but tried to build up blacks from all the layers of blue and green.